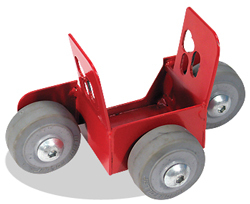 "GRINDER CADDY™" BLADE ROLLER™ - REMOVABLE ROLLING CARRIAGE FOR 4 AND 4-1/2" GRINDERS. Non-marking wheels. Eliminate costly heavy equipment. Great for crack-chasing and tuck pointing. USES: Scoring decorative lines; Tuck pointing; Stone and masonry work; Fabrication; Crack chasing.